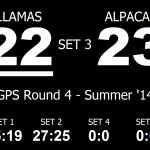 Volleyball Presenter is a completely free-of-charge (gratis) scoreboard software for Windows designed to be controlled with a 4-button presenter remote/clicker. 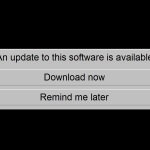 You may be presented with a Windows SmartScreen dialog that hides the option to start the software. You’ll need to click the small ‘More info’ link to display the ‘Run anyway’ button. Volleyball Presenter (“the software”) is available at zero cost; however, I do require you comply with certain conditions regarding its use. Reverse-engineering or otherwise decompiling the software is not allowed. You may link to any part of this website, including this page; however, hosting the EXE file on your own site, or including the EXE file wrapped in any other file (including, but not limited to, an installer), is forbidden. If you wish to include this software in an offline medium which you intend to distribute, such as a CD, you are required to please contact me for permission. I may, at any time and for any reason, contact you to require you to stop using the software and delete all copies of it. Volleyball Presenter sends information including, but not limited to your IP address and version number to my server for the purpose of checking for updates to the software. This data may be logged, and I do not make any guarantees regarding its security. Volleyball Presenter is offered to you at zero cost on an “as is” basis, with no guarantee of support or warranties, express or implied. I am not responsible for any loss or damage caused, foreseeable or otherwise, to you or your property that arise from the use of the software or any related components, including but not limited to its update mechanism, its documentation or this website. If any use of this software would have the possibility of breaching these terms or the intention of these terms, it must be assumed that the use in question is forbidden, and I should be contacted for clarification. Copyright © 2014-2015 Joshua Todd Cowper. All rights reserved. This section is incomplete and being slowly built up over time. In the meantime, please contact me if you have any queries. You’ll need to click the non-prominent More info or More Options link to display the Run Anyway button. How do I access options or quit Volleyball Presenter? Click anywhere to display the settings screen. Here you’ll have options to set team and match names, reset sets, change remote/keyboard settings and quit the software. How do I operate the scoreboard? 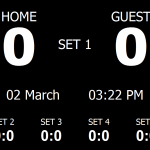 To reset the scores on any or all sets, access the settings screen by clicking anywhere, tick the reset sets boxes and hit apply. 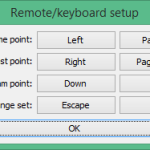 See the topic on changing keyboard/remote settings if you would like to customise these controls.